After years of 'hardship', Muslim women have found a way to free themselves from instant triple talaq, Prime Minister Narendra Modi said on Sunday in his first remarks on the issue after a bill to criminalise the practice was passed in the Lok Sabha. He also said that the policy of allowing Muslim women to perform Haj only in the company of a male guardian was 'injustice' and discriminatory and his government has removed the restriction following which hundreds of women have applied to travel alone for the pilgrimage. The prime minister made these remarks highlighting the efforts of his government to give equal opportunities to Muslim women at two separate events. Without referring to the Muslim Women Protection of Rights on Marriage Bill passed by the Lower House last week, Modi said, "The hardship faced by Muslim mothers and sisters over triple talaq is not hidden from anyone. After years of struggle, they have found a way of freeing themselves from (the practice) of instant triple talaq." The bill makes instant triple talaq or 'talaq-e-biddat' illegal and provides for a jail term of up to three years for the husband. The offence has been made cognisable and non-bailable. Women under the draft law can seek subsistence allowance and can claim custody of minor children. A magistrate's court is empowered to decide on the quantum of jail term, amount of fine, subsistence allowance and custody of minor children. The bill awaits clearance by the Rajya Sabha where it may come up on Tuesday. 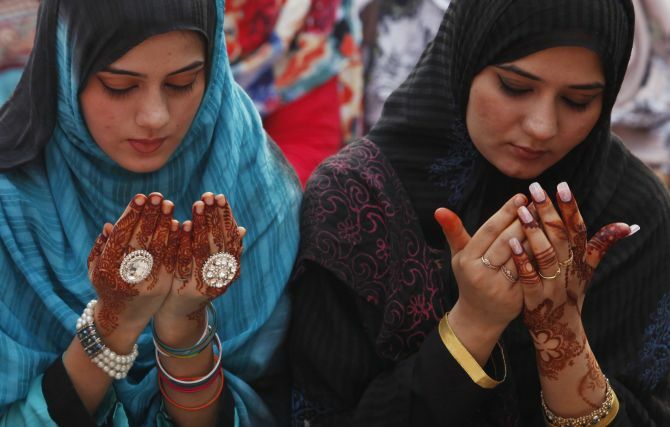 On Prime Minister Narendra Modi's suggestion, Union minister Mukhtar Abbas Naqvi on Sunday assured those women who have applied to go for Haj without 'Mehram' that they will be exempted from the lottery system and would be allowed to proceed for the annual pilgrimage. Around 1,300 women have applied to undertake the journey next year to Saudi Arabia without 'Mehram', Minority Affairs Minister Naqvi said. The term Mehram refers to a male, a woman cannot marry in her life (i.e. father, brother or son etc). 'After PM Shri Narendra Modi Ji's suggestion, I assure that those about 1,300 women, who have applied to go for Haj without 'Mehram', will be exempted from the lottery system and allowed to proceed on Haj,' Naqvi tweeted. He also thanked Modi for mentioning the ministry's decision to lift the ban on women going for Haj without 'Mehram' on his radio programme. Modi made the remarks while delivering the inaugural address at the 85th Sivagiri pilgrimage celebrations, at Sivagiri Mutt in Varkala in Kerala through video conference. He also referred to the issue of Haj pilgrimage by women in his monthly 'Mann ki baat' radio address and said removal of the restriction of having a male guardian or 'mehram' may appear as a 'small thing', but such issues 'have a far reaching impact on our image as a society'. According to the Ministry of Minority Affairs, Muslim women above 45 years will be allowed to go for the pilgrimage without 'mehram' in a group of at least four. The prime minister said he was surprised when he first heard about the restriction. "Why this discrimination? And when I went into the depth of the matter I was surprised to find that even after 70 years of our Independence, we have such restriction. For decades, injustice was being rendered to Muslim women but there was no discussion on it," he said in his broadcast. Modi said that such a restriction was not prevalent in many Islamic countries. "I am happy to note that this time about 1,300 Muslim women have applied to perform Haj without 'mehram' and women from different parts of the country, from Kerala to north India, have expressed their wish to go for the Haj pilgrimage," he said. The prime minister said he has suggested to the Ministry of Minority Affairs that they should ensure that all the women who have applied to travel alone be allowed to perform Haj. "Usually there is a lottery system for selection of Haj pilgrims but I would like that single women pilgrims should be excluded from this lottery system and they should be given a chance as a special category," he said. Referring to Christmas in Mann ki Baat, Modi said Jesus Christ taught us about the spirit of service or 'sewa bhaav'. "Be it any religion, caste or creed, tradition or colour in this world; the spirit of service is an invaluable hallmark of the highest human values," he said. He also recalled the life of Guru Gobind Singh which was full of instances of courage and sacrifice. On the 350th anniversary of the Sikh guru, he said Guru Gobind Singh preached the virtues of sublime human values and at the same time, practiced them in his own life in letter and spirit. The prime minister also urged youths, who turn 18 on Monday, to register as electors and said their votes would prove to be the bedrock of New India. He suggested that 'mock Parliament' be organised around August 15 in Delhi, comprising a young representative selected from every district of the country who would deliberate on how a new India could be formed in the next five years. He said mock parliaments should be organised in every district before the proposed event in August in the national capital. He said in the new year, people should take concrete steps to make a 'progressive India' and also recounted an inspirational story of Anjum Bashir Khan Khattak, the topper of the Kashmir Administrative Service examination. "He actually extricated himself from the sting of terrorism and hatred and topped in the Kashmir Administrative Examination. You will be surprised to know that terrorists had set his ancestral home on fire in 1990," Modi said. He said terrorism and violence were so widespread there that his family had to leave their ancestral land and flee. For a young child, such an atmosphere of violence could easily create darkness and bitterness in heart, but Anjum did not let it be so and he never gave up hope. He chose a different path, a path of serving the people, he said. He also recalled his meeting with young girls from the state and said he was amazed at the spirit that they had, the enthusiasm that was there in their hearts and the dreams they nurtured. He said people born in the year 2000 or later would gradually begin to become eligible voters from January 1, 2018. "The Indian democracy welcomes the voters of the 21st century, the 'new India voters'. I congratulate our youth and urge them to register themselves as voters. "The entire nation is eager to welcome you as voters of the 21st century...your vote will prove to be the bedrock of new India. The power of the vote is the greatest strength of a democracy. It is the most effective tool in bringing about a positive change in the lives of millions of people," he said. According to the Election Commission, 13,430,193 people who were 18-19 years of age voted in the 2014 Lok Sabha polls. "...new India will be free from the poison of casteism, communalism, terrorism and corruption; free from filth and poverty. In the New India everyone will have equal opportunity and aspirations and wishes of everyone will be fulfilled. New India will be a place where peace, unity and amity will be our guiding force," Modi said in his broadcast. On cleanliness, Modi said a change can now be seen in the form of public participation in rural and urban areas alike. He said Cleanliness Survey 2018, the largest in the world, will be conducted from January 4 to March 10 to evaluate the achievements of the mission in urban areas. This survey will cover a population of more than 40 crore in over 4,000 cities. He said this Republic Day, not one but ten chief guests would grace the January 26 parade at Rajpath. "...January 26, 2018 will especially be remembered through the ages. The Republic Day will be celebrated with leaders of all ten ASEAN (the Association of Southeast Asian Nations) countries coming to India as chief guests...this is unprecedented in India's history," he said. He said, 2017 has been special for both ASEAN and India. While, ASEAN completed 50 years of formation and India's partnership with ASEAN also completed 25 years. "On January 26, the arrival of great leaders of 10 nations of the world as a unit is a matter of pride for all Indians," Modi said.